Well, here we are again. The holiday season is upon us. Amazing how fast the year goes by! Many of us have not even had time to think about putting together a holiday party, so we are here to remind you that perhaps you need to start thinking about it. Most businesses will have at least one small work gathering for Christmas. But not every business can afford to break the bank and throw one large party for all of their employees... especially under today's economic conditions. So for those businesses or employees looking to host a smaller gathering or a party for the department in which they work, look no further. We can handle any or all of your needs. 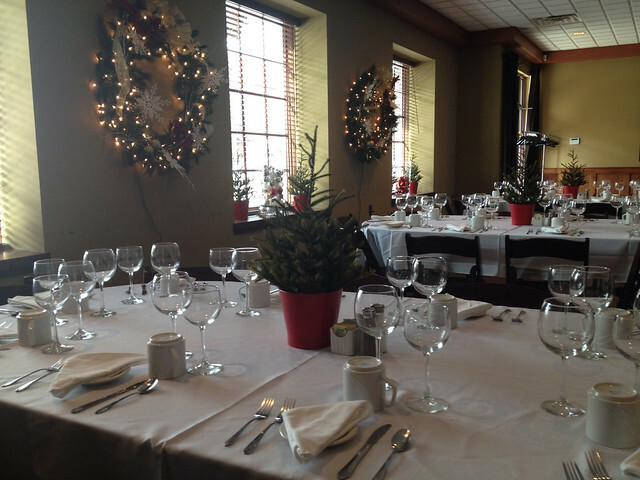 Groups do not have to book our banquet room to host a party. We have many areas within our restaurant that can accommodate groups from 5 to 30 or more. You won't find anywhere more accommodating than the Uptown. Our private banquet facility can accommodate groups upwards of 100 people, and we still have a few prime dates available this holiday season. Those dates include Friday/Saturday, December 19th & 20th, and the room is again available immediately following Christmas on Friday/Saturday, December 26th & 27th. We've found that businesses don't like to host events so close to Christmas because it is hard for everyone with their busy holiday schedules. But, if you are looking to put something together last minute, remember that we are available. In the dining room, we allow large parties to order off the menu without limiting the selection, in addition to offering full access to our bar. Separate checks are never a problem for us, so whether you want to have a salad and an appetizer or a bottle of wine and a filet, you will never have to feel uneasy about running up someone else's tab. Serving larger groups is something that we have become very comfortable doing. 95% of our larger groups all have their meal come out at the same time. Everyone is served together, so there is not that uncomfortable half of the table waiting to eat before the other half gets served. We can serve 25-30 guests just as fast as we can serve a four-top. We say 95%, because we know we are not perfect, and serving larger groups is a difficult thing for a kitchen. Occasionally we do miss an entree, but for your money, we don't think anyone is as accurate and consistent at serving larger groups as we are. If you haven't thought about booking a party, give us a call and we'll handle the work.